Aikido is a classical Japanese martial art developed in the early part this century by Morihei Ueshiba, known to Aikido students as O-Sensei (which means Great Teacher). O-Sensei was an extraordinary man, highly skilled in a variety of martial arts, as well as a devoted student of religion and philosophy. O Sensei believed that the purpose of the martial arts should not be only for self-defense or a way of defeating an opponent. Rather, he felt it should be used as a means of developing ourselves as human beings and a way of coping with the stress and confusion of a rapidly changing world. In Aikido we never clash with an attacker head-on. Instead, utilizing evasive, circular movements we blend with the attack, leading the attacker into a variety of throws or joint locking techniques. 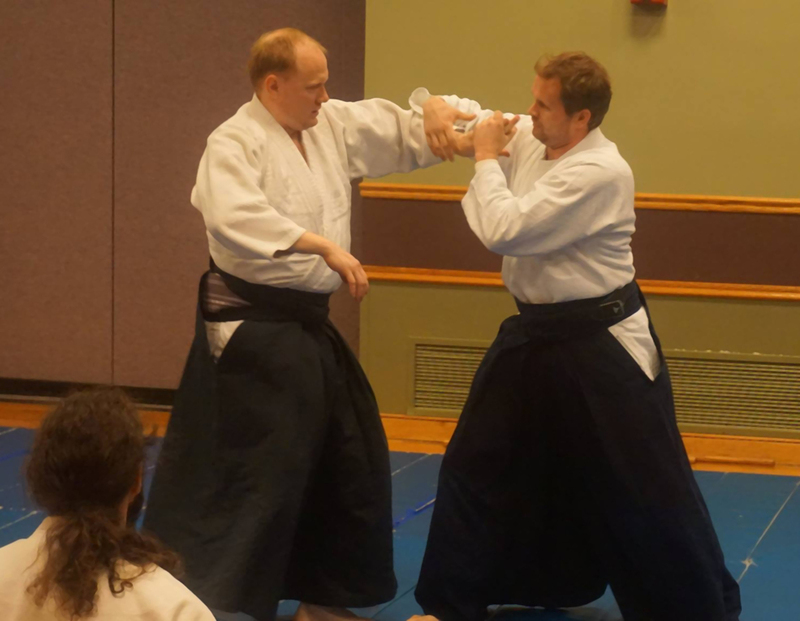 Although Aikido is a powerful and effective form of self-defense, the techniques have been developed in such a way as to avoid permanent injury to an attacker. You don't have to be strong or young to practice Aikido. It can be practiced by women, men and children of all sizes and ages, since it uses the attackers' size and strength against them. Practice is geared toward an individual's ability and comfort level when he or she begins, and classes are conducted with a spirit of encouragement. Students help each other learn the techniques, and one learns as much from performing the technique as from receiving it. While Aikido does not focus on weapons practice, the movements are derived from defense against weapons attacks. The dojo does, therefore, practice some weapons training with wooden practice weapons: the jo (staff), bokken (sword) and tanto (knife). Weapons training should always be taken very seriously. Even though the practice weapons are wood, careless use of them can seriously injure one's practice partner. For this reason, weapons practice is usually reserved for students with a fair amount of Aikido training. There are no tournaments or competitive matches in Aikido. Instead you learn through repetitive practice in a thoughtful, studious atmosphere. Being non-competitive in nature, Aikido practices can be soft and flowing or vigorous and aerobic depending on the desires of you and your partner. Aikido promotes suppleness, flexibility and concentration as well as a confident, balanced personality. Generally speaking, personal growth should be the focus of one's Aikido practice, and not the gaining of rank. The lack of competition against others fosters an attitude of competition with one's weaknesses instead; thus, one is in competition with oneself. However, a ranking system does exist in Aikido. Students start out unranked. After attending 60 days of classes, a student may test for his or her first rank: 5th kyu (prounounced cue). Once a student has tested successfully, the practice count begins over. Upon 80 more days of practice, the student may test for 4th kyu, and so on. Kyu ranks continue up to 1st kyu. Dan rankings are the next step after kyu rankings, and count upward from one. A shodan (first dan) is what most martial arts call a "first degree black belt." Progressing in dan rankings typically takes years of practice, as well as going to multiple outside seminars. It is said that achieving one's shodan is the point where an Aikidoist finally becomes a serious student. In many dojos, rank is signified by the color of the belt worn by the student, and by the hakama typically worn by dan students (also called yudansha. Kyu ranked-students are yukyusha). While it is tempting to think that simply putting in the appropriate amount of time qualifies one to test, testing is always up to the discretion of one's Sensei. Testing is not simply about one's completed hours, but is also about one's attitude and ability.